The S9 /AirSense 10 disposable filters come in a pack of 1, 2 or 6. 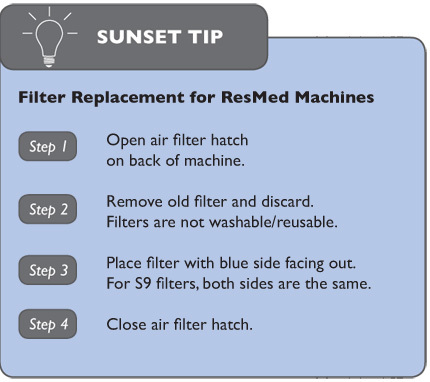 The ResMed S9/AirSense 10 do not use reusable foam or disposable filters like most machines: these filters are different and are for the S9/S10 specifically. For a more hygienic sleep apnea therapy, replace your filters regularly. Over time, filters lose their ability to effectively guard against debris and bacteria. As the filter becomes discolored, it will lose it's ability to effectively block pathogens from your CPAP hose. Disposable filters should be changed every three to six weeks.